Pericardium is the membrane sac that encloses the heart in vertebrate animals. The pericardium’s outer coat (the parietal pericardium) is tough and thickened, loosely cloaks the heart, and is attached to the central part of the diaphragm and the back of the breastbone. Its inner coat (the visceral pericardium or epicardium) is double, with one layer closely adherent to the heart and the other lining the inner surface of the outer coat. Pericardium is the fluid filled sac that surrounds the heart and the proximal ends of the aorta, vena cava, and the pulmonary artery. Together, the heart and circulatory system form the cardiovascular system. The primary function of the heart is to help circulate blood to the tissues and organs of the body. 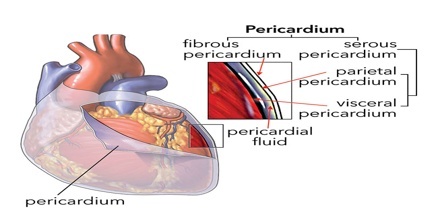 Inflammation of the pericardium is called pericarditis, and may be detected by the medical sign pericardial friction rub. An excess of fluid in the cavity can result in cardiac tamponade (compression of the heart within the pericardial sac). A pericardiectomy is sometimes needed to remedy this. The surgical removing of the epicardium is referred to as epicardiectomy. Fibrous Pericardium – It provides an outer protective layer that is attached to the sternum by sternopericardial ligaments. 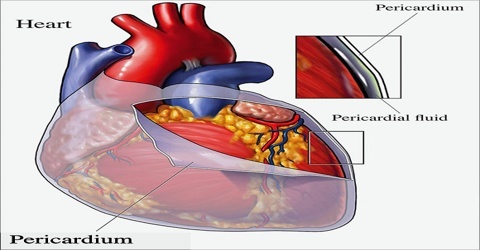 Fibrous pericardium helps to keep the heart contained within the chest cavity. It also protects the heart from infection that could potentially spread from nearby organs such as the lungs. 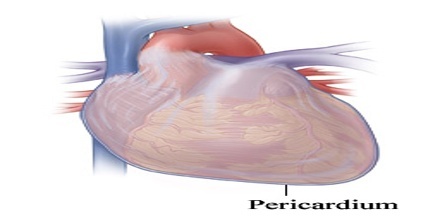 Parietal Pericardium – This layer between the fibrous pericardium and visceral pericardium. It is continuous with fibrous pericardium and provides an additional layer of insulation for the heart. Visceral Pericardium – This inner layer of the pericardium also forms the epicardium, or outer layer of the wall of the heart. It protects the inner heart layers and also assists in the production of pericardial fluid. It prevents the heart from over-expanding when blood volume increases. Reference: medicinenet.com, dictionary.com, thoughtco.com, wikipedia.